Android devices come in all sizes, shapes and screen densities. That’s why I’m a huge fan of using resolution independent, vector assets. But what exactly are they? What are their benefits? What are the costs? When should I use them? How do you create and use them? In this series of posts I’d like to explore these questions and explain why I think that the vast majority of the assets in your apps should be vectors, and how to get the most out of them. Most image formats (png, jpeg, bmp, gif, webp etc) are raster which means they describe the image as a fixed grid of pixels. As such they’re defined at a particular resolution and don’t understand anything about their contents, just the color of each pixel. Vector graphics however describe the image as a series of shapes defined over an abstract canvas size. Vector images resize gracefully; because they describe the image over an abstract canvas size you can scale this canvas up or down and then redraw the image at that size. Raster assets however can deteriorate when you resize them. Scaling raster assets down tends to be ok (as you’re discarding information) but scaling them up leads to artifacts like fuzziness or banding, because they have to interpolate the missing pixels. Android picks the closest larger density and scales it down (if needed). With the trend for devices with ever higher density screens, app makers must keep creating, including and shipping ever larger versions of the same assets. Note that many modern devices don’t sit on exact density buckets (e.g. the Pixel 3 XL is 552dpi, somewhere between xxhdpi & xxxhdpi) so assets will often be scaled. Because vector assets resize gracefully, you can include a single asset, safe in the knowledge that it will work on any and all screen densities. Vector assets are generally* more compact than raster assets both because you only need to include a single version, and because they compresses well. For example here’s a change from the Google I/O app where we switched a number of icons from raster PNGs to vectors and saved 482KB. While this might not sound like much, this was just for small iconography; larger images (such as illustrations) would have larger savings. Note that while Android App Bundle’s density configuration splits bring similar benefits by only delivering the required density assets to the device, a VectorDrawable will generally still be smaller and also removes the need to keep creating ever larger raster assets. As vector images describe their contents rather than ‘flattening’ them down to pixels, they open the door to interesting new possibilities like animation, interactivity or dynamic theming. More on this in future posts. 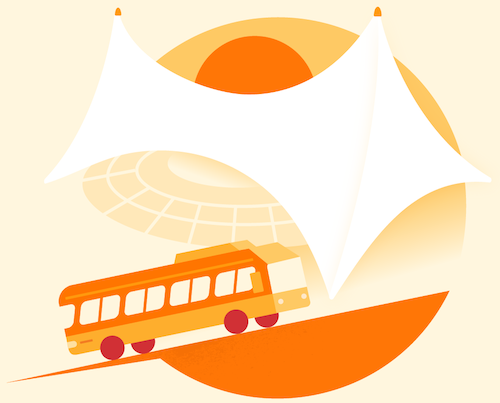 As previously stated, vector assets describe their contents, therefore they need to be inflated and drawn before use. Inflation. Your vector file has to be read and parsed into a VectorDrawable modeling the the paths, groups etc you declare. Drawing. These model objects then have to be drawn by executing Canvas drawing commands. Both of these steps are proportional to the complexity of the vector and the type of operations you perform. If you use very intricate shapes, it will take longer to parse this into a Path. Similarly, more drawing operations will take longer to perform (and some are more expensive e.g. clip operations). We’ll revisit this in a future post in this series on profiling these costs. For static vectors, the drawing stage only needs to be performed once and can then be cached to a Bitmap. Animated vectors, can’t make this optimization as their properties necessarily change requiring re-drawing. Compare this to raster assets like PNGs which only need to decode the file’s contents, something which has been highly optimized over time. This is the essential tradeoff of raster vs vector. Vectors provide the aforementioned benefits but at the cost of being more expensive to render. 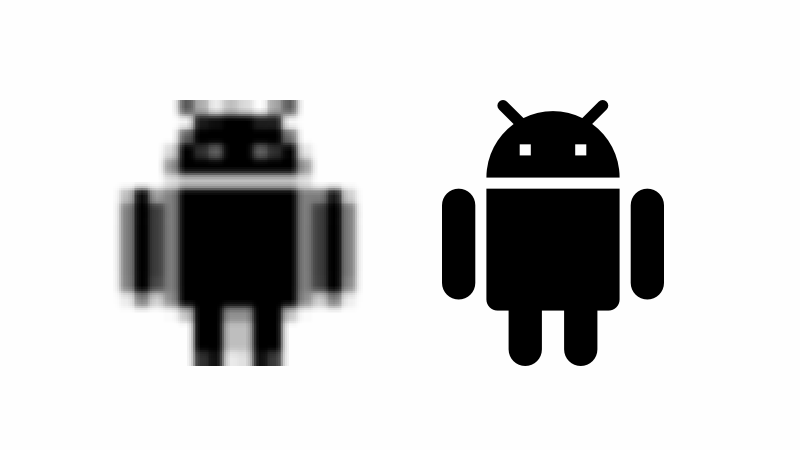 In Android’s early days, devices were less powerful and screen densities differed little. Today, Android devices are more powerful and come in a huge variety of screen densities. This is why I believe it is time for all apps to move to vector assets. Due to the nature of the format, vectors are great at describing some assets like simple icons etc. They’re terrible at encoding photographic type images where it’s harder to describe their contents as a series of shapes and it would likely be a lot more efficient to use a raster format (like webp). This is of course a spectrum, depending upon the complexity of your asset. No design tooling (that I know of) creates VectorDrawables directly which means that there is a conversion step from other formats. 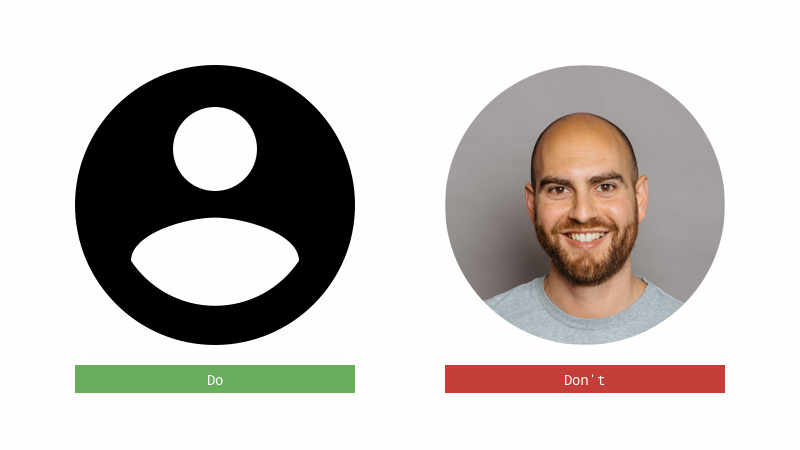 This can complicate the workflow between designers and developers. We’ll go into this topic in depth in a future post. SVG does however include a path spec which defines how to describe and draw shapes. With this API you can express most vector shapes. This is essentially what Android supports: SVG’s path spec (plus a few additions). Additionally, by defining its own format, VectorDrawable can integrate with Android platform features. For example working with the Android resource system to reference @colors, @dimens or @strings, working with theme attributes or AnimatedVectorDrawable using standard Animators. Note that you need to specify the asset’s intrinsic size, which is the size it would be if you set it in a wrap_content ImageView. The second viewport sizes define the virtual canvas, or coordinate space all subsequent drawing commands are defined in. The intrinsic and viewport dimensions can differ (but should be in the same ratio)—you could define your vectors in a 1*1 canvas if you really want. You might wonder if you need to care about this level of detail — don’t you just get these from SVG files? While you don’t need to be able to read a path and understand what it will draw, having a basic understanding of what a VectorDrawable is doing is extremely helpful and necessary for understanding some of the advanced features we’ll get to later. Paths by themselves don’t draw anything, they need to be stroked and/or filled. Part 2 of this series goes into more detail on the different ways of filling/stroking paths. You can also define groups of paths. This allows you to define transformations that will be applied to all paths within the group. Note that you can’t rotate/scale/translate individual paths. If you want this behavior you’ll need to place them in a group. These transformation make little sense for static images which could ‘bake’ them into their paths directly — but they are extremely useful for animating. You can also define clip-paths, that is mask the area that other paths in the same group can draw to. They’re defined exactly the same way as paths. One limitation of note is that clip-paths are not anti-aliased. 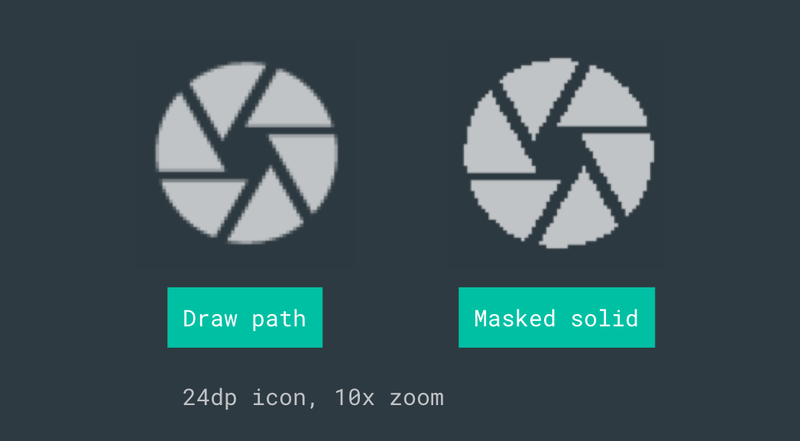 This example (which I’ve had to enlarge greatly to show the effect) shows two approaches for drawing a camera shutter icon. The first draws the paths, the second draws a solid square, masked to the shutter shape. Masking can help to create interesting effects (especially when animated) but it’s relatively expensive so if you can avoid it by drawing a shape in a different way, then do. Paths can be trimmed; that is only draw a subset of the entire path. You can trim filled paths but the results can be surprising! It’s more common to trim stroked paths. You can trim either from the start, or end of a path or apply an offset to any trims. They are defined as a fraction of the path [0,1]. See how setting different trim values changes the portion of the line that is drawn. Also note that offsets can make the trim values ‘wrap around’. Once again, this property doesn’t make much sense for static images but is handy for animation. The root vector element supports an alpha property [0, 1]. Groups do not have an alpha property but individual paths support fillAlpha/strokeAlpha. Thanks to Ben Weiss, Jose Alcérreca, and Chris Banes.